Mosaics available for purchase are created on fiberglass mesh which allows installation into floors, walls or swimming pools. These mosaics can also be mounted and framed for hanging pieces at an additional cost. 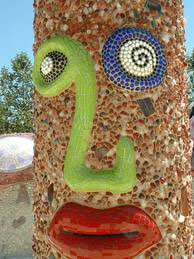 All work can be packaged, delivered and/or installed at an additional cost depending on the mosaic. A wide range of Tools and tiles are available to purchase from Shardworks. Dominic is passionate about mosaic but also about teaching the art itself. With a teaching background Dominic understands the values and lessons learnt from hands on experience and one on one tuition. Education packages can be organised for different groups from primary school up to tertiary level and also community groups. Beginners, Advanced or more fun sculptural courses can be designed for you and your friends. If you have an idea please phone Dom or email us to find out more or to book your next class. Shardworks Mosaic classes are ongoing. They are held on 2 different nights Tuesday and Wednesdays between 5.30 and 7.30pm. Currently we are booked out on Tuesdays but spaces are still available for the Wednesday sessions. We understand people may need to miss a night due to other commitments so we are flexible to allow for this. The course consists of a block of 5 sessions and all tools and most materials are supplied. Students will work on their own projects whilst learning the basic elements of cutting and adhesive techniques. Cost is $220 for the 5 sessions. Subsequent classes for regular students are discounted. Contact: dom@shardworks.com to book a place. It doesnʼt matter if you are a beginner or experienced, we cater to your needs and the emphasis is on fun. You may work in glass, ceramic, stone or other and there are some free materials available in these classes. Regular students are entitled to a discount, as are group bookings. If you have any questions about anything just contact me. Feedback is always welcome!